April 15, 2019 in Breaking Music News // KISS Explodes at Vystar Veterans Memorial Arena on The End Of The Road World Tour!! 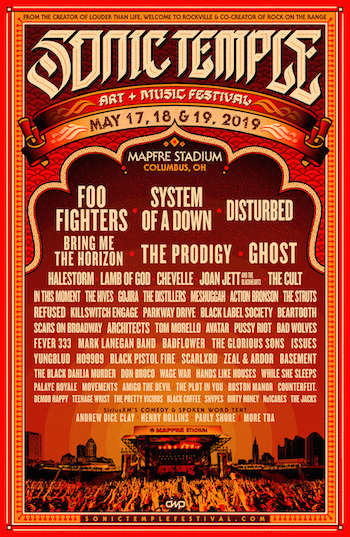 The band performance times have been announced for the 6th annual Monster Energy Fort Rock, held Saturday, April 28and Sunday, April 29 at the festival’s new home at Markham Park in Sunrise, FL, just outside Fort Lauderdale. South Florida’s Biggest Rock Experience features rock’s top artists performing on two stages, including Ozzy Osbourne, Godsmack, Five Finger Death Punch, Stone Sour, Shinedown, Breaking Benjamin, Stone Temple Pilots, Halestormand many more. Monster Energy Fort Rock is produced by Danny Wimmer Presents and AEG Presents and is part of the World’s Loudest Month concert series, which features the biggest names in rock music performing in six U.S. events in distinct atmospheres during five consecutive weekends in April and May of 2018. Monster Energy Fort Rock is fueled by Monster Energy. Additional 2018 sponsors include: f.y.e., Underground Lauderdale, Hello Sunny, Florida Panthers, Love Hope Strength, Miller Lite, Alligator Alley Harley-Davidson, Roadrunner Records, Rise Records, and the Treatment Partners of America.